This post is sponsored by Tabio USA in partnership with FitApproach. All opinions and images are my own. I made the switch to toe socks back in Aug 2014 (thank you IG!) and have never looked back. Well, it did take a couple runs to get used to fabric between my toes. It didn't take more than a couple runs, though, before they were comfier than any other socks. I honestly cannot imagine running in any other type of socks. Toe socks allow your toes to splay during a run which more evenly distributes your weight and allows better running alignment and form. Even weight distribution allows the entire foot to engage when you run. All of this equates to better balance and stability when hitting the pavement or trails. Having a little sleeve for each toe helps to protect them. Before I switched to toe socks, I would often come home with bloody toes. It was like one toe was trying to eat the one next to it. I would have to use a bandage (or petroleum jelly) between my toes as prevention. 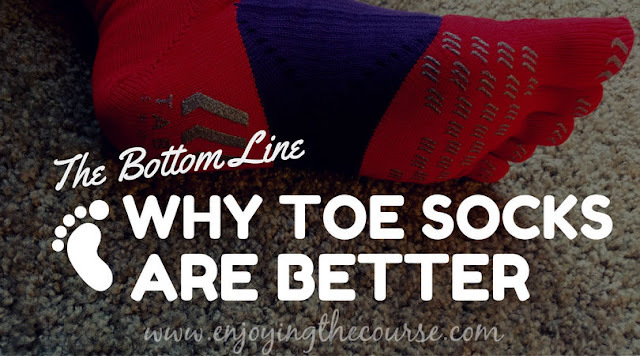 After switching to toe socks, I've never again had this problem! In much the same way, toe socks will help prevent blisters on your toes since there is no skin-to-skin contact. Happy feet equal happy running, and toe socks are sure to help keep your feet nice and happy. Tabio is the #1 sock in Japan and they just started distribution in the USA. Through my affiliation with Sweat Pink, I was sent a complimentary pair of Signature Run Toe socks from the Tabio Sports Collection for review. Right off, I loved the color I received! It's like these socks were made for me. :) If these aren't your colors, though, they come in a nice variety of color options. That contrasting color? It's more than just pretty; it's arch support! A little extra love for your arches to help minimize fatigue. There is also silicon rubber on the soles to prevent slippage in your shoe. This was a little weird for me because I've never really noticed my feet slipping in my shoes. I do like the idea, though, because even if I don't notice it, any subtle slipping probably contributes to fatigue. The silicon rubber can also help prevent black toenails from your feet sliding into the front of your shoe. The Signature Run Toe socks are crafted with Tabio's signature 3D knitting method which ensures not only a natural fit, but also makes the socks really easy to slip on and off. The knit is also quite soft and feels really good on your feet. The mesh knit top is ventilating to let air in and keep odors out. Bonus! Can't forget about the large heel structure! One more place to keep your feet feeling secure and comfortable for your next run. If I haven't convinced you to run #ToeSocksOrNoSocks, Tabio still has you covered with their Signature Toe sock. Do you run with toe socks? Have you tried Tabio USA? I'm linking up today with Erika, Marcia and Patty for Tuesday's on the Run. This week's topic is Running Guilty Pleasures. I've been a huge fan of Injinji, so you already had me at toe socks. I liked the Tabio socks too. Those are cool. I wore Injinji's for awhile and have no clue why I stopped. Is the anti-slip rubber weird in your shoe? It did feel a little odd getting into the shoe but not weird once you got situated. These look cool! I've actually never tried toe socks before, lol. I hope you give them a try! They will change your life. LOL. I know you love compression, so wanted to share that they do have compression socks as well. I love injinji socks! I'll have to give these a try, but wondering about that anti-slip on the bottom. I've only done a few shorter runs in them so I'm not sure about the anti-slip on a longer run. In my head, I do think it would be better on long runs; I just can't speak to it. The anti-slip did seem weird at first, but it's really not bad once you get situated in the shoe. I haven't tried toe socks yet, but I have to keep my toenails short and filed so sharp edges can't come in to play. That's when I know it's time to get the nail file out. I hate wearing socks in general but i've tried running without them (which feels better to me) but I ended up getting blisters on the top of my foot. Maybe i'll start wearing toe socks! You should! 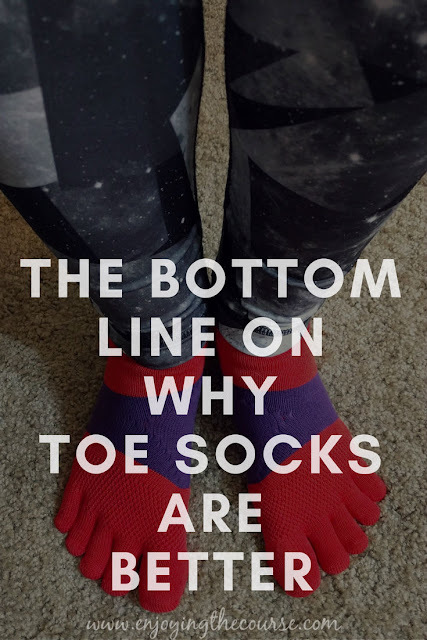 I really think they would help with the blisters and would give you something of the same feeling that you like about being barefoot - allowing your feet to splay and spread out when you run. Ok, you've convinced me. I'm getting some toe socks!!! I have tried toe socks, and I do like them. I'm curious what kind of fabric (?) these are...is a wool blend? I love the idea of arch support already knitted into the sock itself! From their website description of the Signature Toe - Material: Cotton 43%, Polyester 36%, Lyocell 13%, Nylon 7%, Polyurethane 1%. I love the arch support feature, too! That brand is new to me! I have enjoyed my toe socks and probably need to get back to wearing them more. I've never tried toe socks - I don't even wear flip flops because I can't stand stuff between my toes - but your comment about protecting the little piggies from each other has me intrigued. I frequently come home with a bloody toe because one of my piggies is apparently a butthead and he digs into his neighbor. *insert angry emoji here* I guess maybe I do need to try these! I totally get that, and I probably wouldn't wear toe socks just for lounging around. I have come to love them particularly for the same little piggie problem you have! That is exactly what would happen to me and I love not having to deal with bloody toes and ruining socks because of them. I'll try these! my toes sort of naturally overlap a bit so I'm even more prone to rubbing and blisters than people with normal toes. ha ha. what are they made of? Yeah! My 2nd and 3rd toes tend to get real cozy with each other. LOL. Maybe you're more normal than you think... haha! 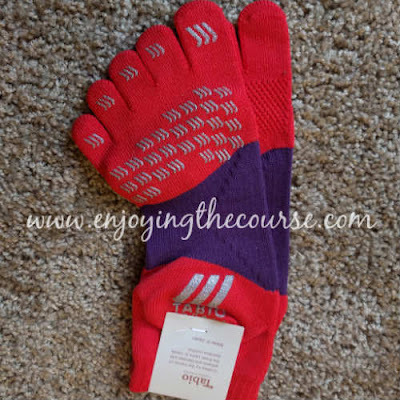 I recently tried the non-toe version of the Tabio socks and LOVED them. I can't deal with the feel of toe socks (can't stand sandals with the thing between my toes either), so I was thrilled they had the other version. I never thought I'd like toe socks for the same reason, but I don't mind the feel between my toes while running. Not having bloody toes makes it worth it for me. Glad you liked the traditional version of the Signature Run socks. Tabio seems like a great company! I like toe socks, but my problem with them is they're not cushioned enough. I need some cushion on my soles! I do run in some occasionally, but I haven't tried tabio. I felt like the Tabio socks were pretty thick, so maybe they would be better. I don't really have cushioning issues, though.